This is what it looks like when a gun is pointing at you. It's a terrifying view that I hope nobody ever has to see. 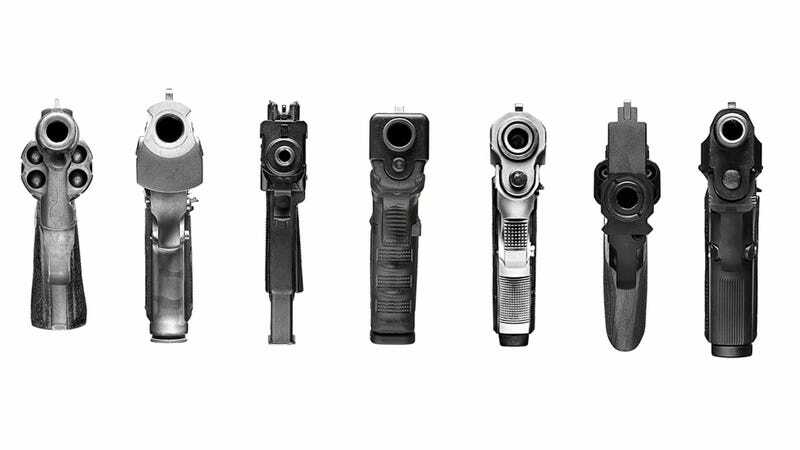 With photographs captured by Peter Andrew, Simon Duffy and Derek Blais, the ongoing photo series Point Blank shows what different types of guns—Glocks, Desert Eagles, Uzis, etc.—look like up close. It's an interesting angle because some look like harmless flashlights while others leave no doubt about its killing ability. We also loved the impossible perspective these portraits provided. Typically, when you see a gun at this range and perspective it’s usually seconds before the pistol is fired. This makes it very hard to examine at point blank range. As the viewer, you want to lean in and see the detail; but at the same time it’s very uneasy to be as close as you are to the barrel of a gun.